A Raspberry Pi in depth tutorial site. In this tutorial I document what I did to set up Raspberry Pi (RPi) as a torrent server. Before you begin, please set up your RPi correctly. 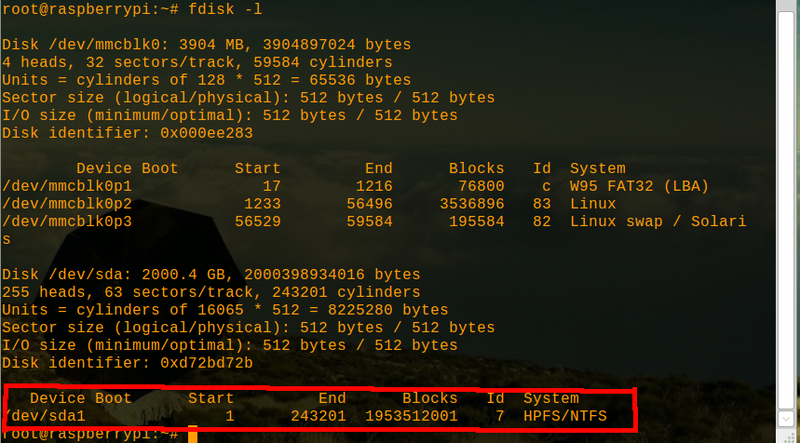 See: http://elinux.org/RPi_Easy_SD_Card_Setup. A GOOD quality power supply (>= 2A current maximum). This tutorial is presented in three parts. I give the basic setup on the RPi itself to get the task done. After this, more advanced tweaking options for transmission torrent client are given. Depending on your kernel or possible errors that occur, I outline some additional problems I encountered, and how they were solved. Note: For the code examples given, single arrow “>” means command line input. Double arrow “>>”means the lines one puts in the configuration files. and give root a password. Now log out of the system, and sign in as root. There are actually three different packages for the torrent client: transmission, transmission-daemon, and transmission-cli. 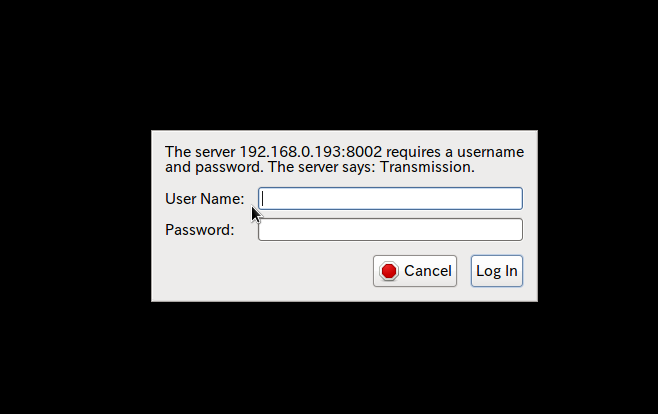 transmission is the regular application that a desktop user would run; in an X windows environment it would launch a GUI front end. Transmission is a lot more robust than this; transmission-daemon is a ‘headless’ (non-GUI) form of transmission used for more complex setups (such as, having multiple instances of transmission running across multiple computers in a LAN). We only need one instance of transmision-daemon for our purposes. Here we are enabling the Remote client. Set “rpc-enabled” to true, as well as your chosen port, password and user name. Note #1: Security conscious users might be worried about storing their password in plain text. Dont worry: when transmission starts running, it reads this file and replaces the password entered with a hashed password. You can check this out yourself to verify it. and see if your desired port is already registered! If you are on a LAN, your IP address should have the form 192.168.X.Y. 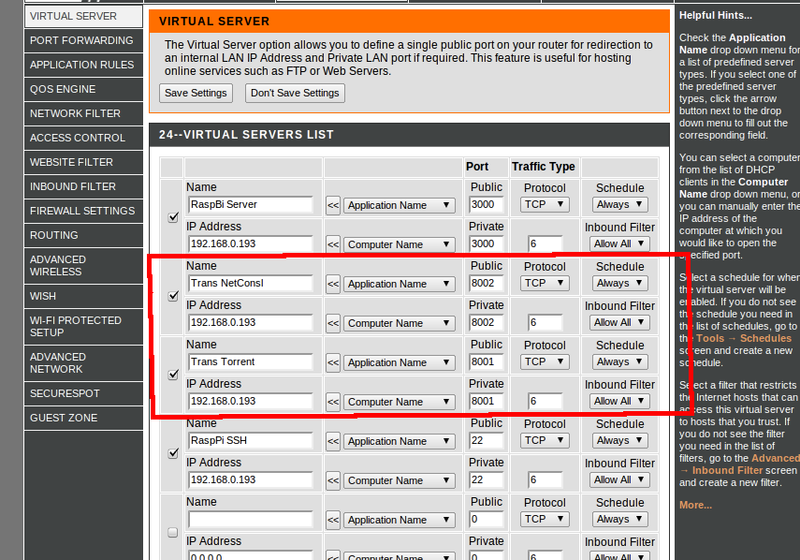 Log into your router, and in the ‘Virtual Servers’ tab, associate your chosen port number to your RPi’s given IP address. Here it is for my router: I’ve chosen port 8002 for the webconsole, and 8001 for incoming torrent traffic. Most routers have DHCP enabled, so we need a static IP address for port mappings to hold. Configure your router to permanently assign the RPi and IP address, so the mappings sticks. Again, it’s up to you to find this option on your router. On my router (a D-link), I was able to do this under “Network Settings”. 5) We need to connect an external hard drive to Linux, to store our torrent files. I happened to have an NFTS file system on my external hard drive. RPi will recognize the drive, but it may not mount it correctly. Where <your directory name> is the name chosen when we made the directory (above). Save the file. file to make this possible. Restart your RPi. Basic setup is done! 2) Now check to see if you can access from outside your LAN. You will need the IP address assigned to your modem, from your ISP (google: whats my ip? to get this). In a browser type: http://<your modem ISP>:<your webUI port number>. You should go straight to the webUI console, if you already logged in in step (1). “cache-size-mb”: Sets our cache size before writing to the External USB drive. “download-limit”, “download-limit-enabled”: Set your download limits. “encryption”: Set to 1 to turn it on. “max-peers-global”, “peer-limit-global”,”peer-limit-per-torrent”: Control the number of peers that connect to your server. “open-file-limit”: Limit how many torrent files can download at once. “ratio-limit”, “ratio-limit-enabled”: Limit your Leech:Seed Ratio. Be nice and set it to 1.000 or above :). “script-torrent-done-enabled”,”script-torrent-done-filename”: Quite an interesting feature. When your torrent file finishes, you can run a script to process it, or move it to another directory. “speed-limit-down”, “speed-limit-down-enabled”, “speed-limit-up”, “speed-limit-up-enabled”, “upload-limit”, “upload-limit-enabled”, “upload-slots-per-torrent”: This whole list of options controls download and upload speeds. Alas, doing the basic setup probably won’t work for everyone. I had a number of issues I had to solve before I could get things working. 1) Incomplete torrent files don’t stick around: Make sure the “incomplete-dir-enabled” option is set to True (1). 2) My RPi’s Ethernet Driver keeps crashing! This is by far the biggest issue for the whole setup. You might find that doing file transfers or Downloads at high speeds (> 500k/sec) causes the RPi ethernet driver to crash. You won’t be able to SSH into the RPi, or access the internet with it, but the RPi runs fine otherwise. The reasons for this vary. Perhaps a bit of background is in order. The RPi Ethernet and USB ports are controlled by one single chip, which share the same system bus. Naturally, our torrent box application puts a lot of load on this chip and bus. Not only is a lot of traffic flowing through the ethernet port, but we are also using the same system bus to write to the USB connected hard drive. More specifically, Ethernet packets are being saved to a cache in memory (RAM), as are the incomplete torrent files. RPi also writes cached information to the disk, while accessing other disk files to supply information to other leechers on our torrent network. So there is high two-way traffic across the bus. You better have a well compiled kernel to handle all this traffic correctly. (a) Use a proper power supply: I’ve mentioned this before. And I know using your microUSB phone charger to power the RPi is tempting. But high External Hard Drive + Ethernet usage needs more than the 700mA minimum quoted in the RPi operating specs. Most phone power supplies are 1A or below. Please try a more beefy power supply. Really. and restart your system. I got my kernel from the RPi fourm thread [ http://www.raspberrypi.org/phpBB3/viewtopic.php?f=28&t=5142&hilit=%5Bsolved%5D+ethernet&start=25 ], and it alleviated my Ethernet problems. …. locate the line vm.cache_size…. And save the file. Restart your system.